Argentine-born artist Julio Le Parc reimagines his own masterpiece for a collection of Hermès scarves. 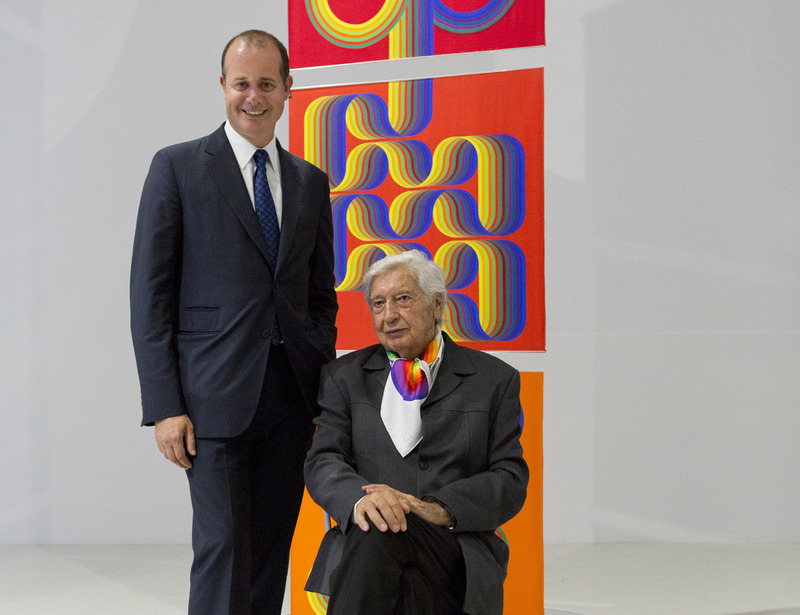 Hermès creative director Pierre-Alexis Dumas, left, with Julio Le Parc at the Museum der Kulturen in Basel. In 1937, the year Hermès launched its scarf business, Julio Le Parc was just a 9-year-old boy in Mendoza, Argentina. In his teens, Le Parc moved to Buenos Aires, where he attended the National School of Fine Arts. Later, he went on to gain renown for his exper- imental works involving kinetics and light. A founding member of the Groupe de Recherche d’Art Visuel collaborative in Paris from 1960 to ’68, he won the Grand Prize in Painting at the Venice Biennale in 1966. Now 86 years old and based in the Paris suburb of Cachan, the sculptor and painter has brought his artwork to a new medium: the silk scarf. During the Art Basel fair in Switzerland in June, Hermès creative director Pierre-Alexis Dumas revealed the fourth edition of the brand’s Editeur project at the Museum der Kulturen. Following collaborations with the Josef and Anni Albers Foundation in 2008 (posthumously), Daniel Buren in 2010, and Hiroshi Sugimoto in 2012, Dumas enlisted Le Parc to take on the latest Èditeur itera- tion. For it, Le Parc played with the square of his famous abstract painting “La Longue Marche”(1974–75) on silk, adding a new level of layering and complexity to the work. Le Parc’s rainbow of swerving and swirling bands gains a vibrant sense of energy and movement. Le Parc with print-outs of his designs. Fourteen screens were made in each of the colors of the rainbow. The work’s title and Le Parc’s signature comprised a 15th screen. The colors are true to nature because of the way silk reflects light. Dumas came across “La Longue Marche” at a 2013 solo show at the Palais de Tokyo in Paris—Le Parc’s first major exhibition in France since the 1980s. “I thought, ‘How exciting,’ as well as, ‘What good material for silk-screening,’ because of the finesse of his lines, and the limited number of 14 colors within his register—which is good for printing, as colors don’t overlap,” Dumas says. Le Parc going over the design coloring. The two first met at the artist’s workshop around the time of the Palais de Tokyo show. It was reported that their initial meeting was un coup de foudre—a bolt of lightning. “A coup de foudre, you say?” Le Parc says, surprised. “Did you not fall in love with him immediately, too? [Dumas] was very sym-pathique.” So sensitive, in fact, that the artist agreed to let Hermès put “La Longue Marche” on backgrounds colored differently from his original work, changing viewers’ perceptions of the piece yet again.